The Doogee S70 is a tough smartphone for those who need good battery, durability and enough power to drive heavier games. The Doogee S70 is a tough smartphone for those who need good battery, durability and enough power to drive heavier games. The durable smartphone is designed for players, and features awesome features combined with IP68 and IP69K classifications. The S70 is equipped with a more sensitive touchscreen that senses your hands even though you wear gloves. The handset also has a separate "Gaming mode", from which the phone optimizes for gaming. In this mode, for example, you are not disturbed by messages, and the load from other background applications is reduced, so that all available power can be utilized by the game itself instead. The phone's back cover has a built-in cooling plate that effectively holds the phone's vital circuits within the limits so that the game does not begin to go slow due to overheating. The powerful P23 processor, combined with the Mali G71 graphics processor and 6GB of RAM, allows the phone to easily enter the battle among the other phones in the segment. Languages: English, Finnish, Swedish etc. 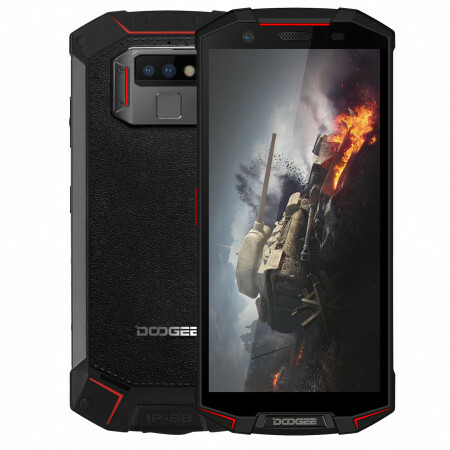 https://www.e-ville.com/en/3045974-vedenkestavat-ja-iskunkestavat-puhelimet/31101-doogee-s70-rugged-gaming-phone.html 31101 Doogee S70 rugged gaming phone http://www.e-ville.com/img/p/31101-155118-fb.jpg 257.95 GBP InStock /Phones & Accessories/Phones/Rugged smartphones /Phones & Accessories/Phones /Phones & Accessories The Doogee S70 is a tough smartphone for those who need good battery, durability and enough power to drive heavier games.